Doug and I decided not to carry a map while we walked around the old city, so before we left our room, we reviewed the map one more time, figuring out the general area we wanted to explore. Of course, by the time we got to the street, I forgot what was where. Add that to the reasons I won't travel alone. I have a horrible sense of direction. I need Doug to help me navigate, otherwise I'm that tourist on the corner with the map spread open. I don't know how he does it, but Doug can look at a map once and know exactly where to go and how to get back. That talent came in handy, because we walked a lot during our four days in Quebec City. 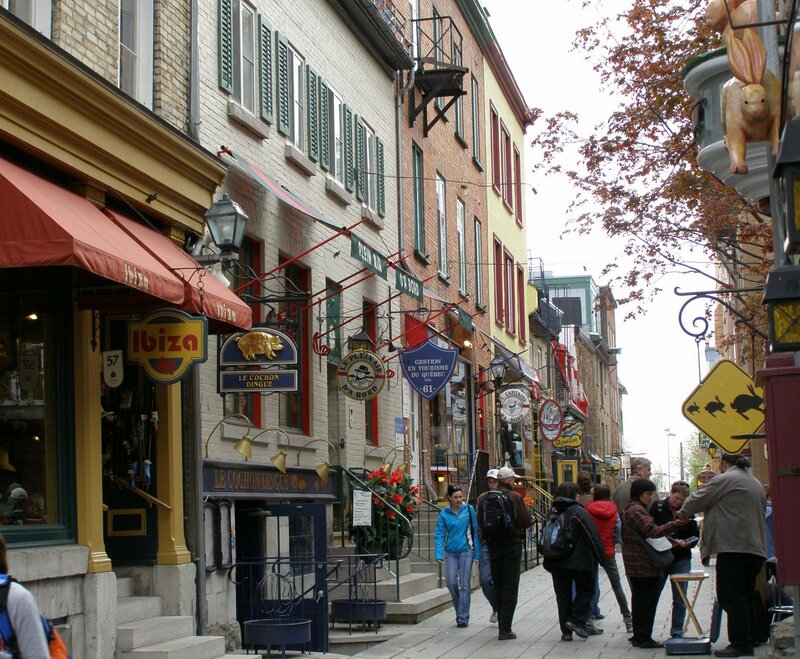 We had fun walking around the upper town, exploring rue Saint-Louis, Sainte-Anne, Garneau, Couillard, rue Saint-Jean and several other roads. 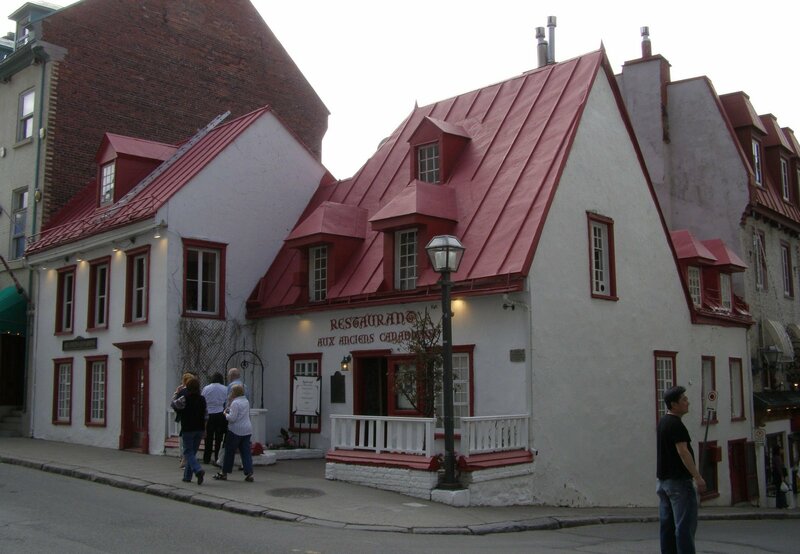 On rue Saint-Louis, we walked by Maison Jacquet, the oldest house in Quebec City. 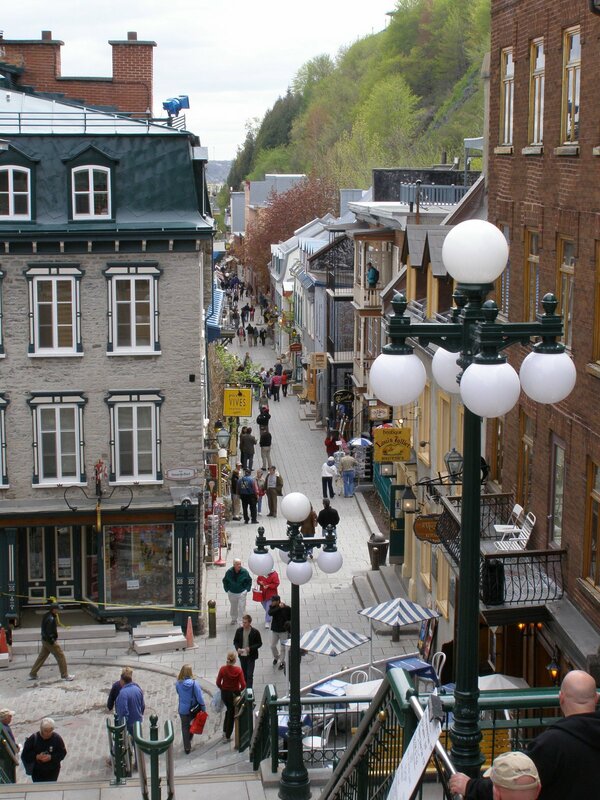 We also explored lower town, walking down Cote de la Montagne, then along rue du Petit-Champlain, Sous-le-Fort, and Notre-Dame. We peaked in the windows, but didn't go into many shops. Everyone else praised the shopping, but I was trying to avoid temptation and impulse buying. I kept repeating my mantra of simplify, simplify, simplify. If you are interested in shopping, though, there is something for everyone. Throughout the city there are benches everywhere for you to sit and relax. We also spent some time at a pub, sitting outside on the patio, enjoying a beer and some chips. I practiced the very few French words I knew and was relieved when the waitress responded with a smile (of course, she could have been laughing). It's such a beautiful language, I wanted to sit there all day, listening to people talk. If you go, be prepared for walking up and down stairs and hills. You can just wander around, shopping and enjoying the architecture, but if you are interested in the history, I recommend getting a good guidebook or going on a walking tour. One book I like is Quebec, A North American Treasure by Donald Dion. The book has wonderful pictures with brief descriptions of the history of different buildings and streets.